God has drawn the attention of true believers towards becoming عابد abid (worshipper of God) and towards adopting high morals because without this one who claims to have faith cannot be called a true believer. The sign of true believers is that they worship God and also shun idle and frivolous matters. It cannot be that one is a true believer but is also discourteous. Usually discourtesy is borne of arrogance and this is why God states about servants of the Gracious God that they: ‘…walk on the earth in a dignified manner…’ (25: 64) and one who is dignified and humble always avoids altercations, seeks reconciliation and is courteous to others. The condition of a true believer is when attainment of pleasure of God is the objective alongside high morals and while effort is made to observe worship of God with its dues. Thus the attributes of a true believer are being عابد abid and being humble. It is also true that each person has his or her own individual spiritual capacity and people have varying physical capacities. At times temporary situations impede these capacities and man cannot maintain consistency in his morals and cannot keep up the standards of spiritual development as are expected of a true believer. For this God has granted ease to true believers; indeed He does not burden anyone beyond their capacity. Therefore to say that certain things are impossible for man to practice is at least not correct as far as Islam is concerned. God has made Salat obligatory but has also given much expediency regarding it. For example, if someone cannot offer Salat standing up, they may do so sitting down. If they cannot offer Salat sitting down due to frailty or illness, they may do so lying down. And there is no stipulation as to how should one lay down. When one is travelling or there are any temporary constraints, Salat can be shortened or combined. In short no matter what no one can say that it is not possible to offer Salat under any circumstances. People whose employment necessitates that their clothes cannot be clean all the time may offer Salat in those clothes. If water is not available tayyammum (dry ablution) may be performed in place of wudu. Therefore a sensible person will not make any excuse to miss offering Salat. If one is in one’s senses, then one must offer Salat. Many people make many excuses in this regard and this distances them from faith. Each one of us needs to focus on this matter! Hazrat Khalifatul Masih said that following his Friday sermon at the inauguration of our mosque in Ireland in which Huzoor had drawn attention to worship of God, he received a letter from a Murrabi Sahib in USA and other letters as well that attendance at mosques has increased after Huzoor’s sermon. It is obvious that earlier the non-attendance was not due to any constraints or unfeasibility and once attention was drawn to the matter it worked. Now the momentum needs to be maintained and for this Khuddamul Ahmadiyya and Lajna need to make special efforts in instilling the practice of regular observance of Salat in the youngsters. Youth is a time of good health and when worship can be offered with its due requisites. In later life one develops ailments which prevent one from offering worship of God with its due requisites. The Promised Messiah (on whom be peace) especially drew our attention to the fact that only worship during youth and while in good health can be offered with its due requisites. One should try and observe commandments of God even by imposing them on oneself let alone avoid them even with all the convenience granted by God in this regard! Indeed one should worship God as thanksgiving for the good health one has! Much effort should be made in this regard as faith cannot be complete without it. The other aspect is that of high morals. A main quality of those with high morals is honesty which is also an attribute of true believers. It is only possible to be this way when one abhors falsehood. People tell lies at various times in life and then say that they did not intend to say what was not true it was simply a slip of the tongue. Those who apply for asylum do this. God is Forgiving and pardons those who feel remorse at their mistake. Of course it is important that regret is shown in such matters. How can one be counted among those who have high morals and be firm on faith when one does not show remorse after telling lies or if one’s lies cause harm to another and one does not redress the situation and on the contrary tries to authenticate the lies or says that falsehood was unavoidable! God states: ‘…and speak to men kindly…’ (2:84) People who are are irritable and bad-tempered by nature do not show their petulance at all times. When God states to speak with people kindly it is these people who are addressed and are enjoined to be gentle and not to get furious at trivial matters. Owing to their nature some people do get inflamed easily. However, if they show remorse and redress the hurt they have caused and also repent, then God states the door to repentance is always open. As for those who disregard this commandment and are needlessly and regularly harsh and do not show any remorse not only lack morals but are also sinful by discounting God’s commandment. Their worship will not avail. God gives hope of forgiveness to those who show anger under the influence of some passion but are later mortified and try and redress the situation. As for those who are not embarrassed and regretful even after coming to their senses, none of their excuses will work before God. Huzoor said we need to self-reflect a lot. Huzoor said many cases come before him some of which are marital conflicts others are regarding business dealings which illustrate people becoming so furious that they do not see what they are saying or indeed what they are doing. Husbands emotionally hurt wives and are also physically violent. In other cases people adopt wrong attitudes. When Ishali Committee or Qadha Board intervenes they do not even try to understand and are inflexible in their attitude. When and if any disciplinary action is taken against them, then they come to come sense, write in to apologise and try and redress the situation somewhat. It is correct that such people save their ending by apologising after being disciplined but they are marked in terms of being chastised. Had they not become embroiled in their egotistical trap the matter could have been resolved by mutual understanding! Then there are those who do not agree under any circumstances. This world and its benefits are temporary. We should be concerned about our ending! Huzoor said he often draws attention to raise our moral standards and not get entangled in egotism over trivial matters. Each member of the Jama’at should try and become a model of humanity. It is human nature to feel anger at times but God has commanded true believers to keep their emotions in check. As regards marital issues, in the Quranic verses recited during the Nikah sermon commandments have been given with righteousness in view and these commandments are essential for both husband and wife. However, some people do not regard them essential and are inflexible. They feel pride in sticking to their stance and demeaning the other party. They deem their sentiments as right and have no consideration for the sentiment of the other person because in their mind the other person deserved to get what they meted out to them. If the outlook of such people is accepted then it means that their religion is false because religion says one thing and they say quite the other. They can of course say that it is difficult for them to abide by whatever religion commands in a given situation but to maintain that whatever they did was unavoidable and there was no other way out is tantamount to falsifying their religion. God commands us to suppress our anger, treat others with courtesy, not be obstinate about our mistakes and try and pay the dues of mankind. In fact the Promised Messiah (on whom be peace) even said that a person who does not pay the dues of man, does not show courtesy as commanded by God will also not be paying the dues of God and his worship will be only pretence as it would not have brought about any good change in him, would not have instilled any humility in him! Huzoor remarked that video cameras are freely available nowadays, if someone makes a video of themselves in a rage and play it back once they come to their senses, they would be so embarrassed at how they behaved! Huzoor said the sphere of the forgiveness of the Muhammadan Messiah is worldwide and thus we too need to widen our scope of compassion. And if we wish to attain beneficence from light of God these are the standards we need to meet. We need to instil patience, fortitude and even-mindedness. If we wish to utter words of wisdom and discernment and take the mission of the Promised Messiah (on whom be peace) forward, we need to shun harshness and anger in our daily life with family as well as outside family. If we do not wish our mental capacities to be ruined we need to avoid thinking ill of others and also avoid anger. If we wish to become true believers we have to employ our capabilities at the right time and place. Anger should only be channelled properly for reformation and not pushed to a state of frenzy. Reckless anger and fury lead to a frenzied state and moderation is required to control emotions. Anger should only be channelled for reformation purposes and not to feed one’s ego. The Promised Messiah (on whom be peace) said that excessive anger leads one to lose their faith. He also said that the beauty of Islam is in high morals, suppressing needless anger and promoting forgiveness. The Promised Messiah (on whom be peace) has enjoined this in numerous discourses and writings but it is our weakness that we do not practice this as we ought to, including ordinary Ahmadis as well as office-holders. Some relate words of the Promised Messiah (on whom be peace) to others and advise them to control their emotions but forget that the Promised Messiah (on whom be peace) said that even if you are in the right lower and humble yourself as if you are a liar. Some people try and prove themselves to be truthful when they are in fact lying and try and appear as the victim when they are in fact the aggressor. How can it be deemed that they have faith? Indeed faith requires that when one comes to one’s senses rather than remain inflexible one should redress any wrong done and if any emotional hurt is caused to another it should be alleviated. Or at least remorse should be felt. We should self-reflect and see how many of us think on these lines! If one has been unfair due to temporary anger and once the anger has subsided one does not remedy the situation and does not even show remorse then as the Promised Messiah (on whom be peace) said the faith of such a person is pretence. It is like a water bubble with nothing but air inside! Huzoor reiterated that we need to self-reflect and see if someone has been unfair to us, have we been tolerant and not responded in anger? Or if we are an office-holder, how many times have we made a decision based on fairness in spite of someone acting unfairly? Tolerance is not simply saying that we are very tolerant; tolerance is not to punish someone when one has the authority to punish! Huzoor explained that if the management of Jama’at recommends disciplining someone while fulfilling the criteria of justice that is a different matter because here a wrong is being disciplined and any pardon in such a situation would become sinful. When someone is unfair a judge or qazi punishes them, just as parents and teachers discipline children. Such punishment/disciplinary action is taken when someone violates Shariah or usurps another’s rights. Huzoor said it is important to clarify this because when people are unfair to others, violate Shariah or usurp rights of others and the administration of Jama’at takes disciplinary action and Huzoor gives a sermon on forgiveness etc. they start writing to Huzoor as Huzoor said they may very well do this time. They say that since Huzoor gave a sermon on forgiveness they should be forgiven! Huzoor said that we should always be grateful to God and ponder that He has made us followers of someone to whom He has given the name ‘Messiah’. We should ponder why was he given the name Messiah, what was about him that distinguishes him from the rest of the Prophets? There is no doubt of course that the attributes and qualities the Holy Prophet (peace and blessings of Allah be on him) were greater than all the other Prophets of God, he had attained the very pinnacle of the characteristics and was the perfect man to whom the perfect Shariah was revealed. However, the other Prophets also had distinctive qualities. One such distinctive quality of Jesus (on whom be peace) can be the reason why the Promised Messiah (on whom be peace) was likened to him. This has been explained by Hazrat Musleh Maud (may Allah be pleased with him) in a most charming manner. He said that the Bible goes as far as saying: ‘But I tell you, do not resist an evil person. If anyone slaps you on the right cheek, turn to them the other cheek also. And if anyone wants to sue you and take your shirt, hand over your coat as well. If anyone forces you to go one mile, go with them two miles.’ Without doubt teachings of all Prophets of God were of kindness but seeing his times Jesus (on whom be peace) taught greater kindness. When God sent the Promised Messiah and named him Messiah and likened him to Jesus (on whom be peace) its significance was that he too was sent with teachings of greater kindness. He was called Messiah because he was sent to guide the Christians and was called Krishan in relation to Hindus. Similarly he had come for Muslims and all other peoples of the world in subservience of the Holy Prophet (peace and blessings of Allah be on him). However, the emphasis was on the name Messiah because his teaching was to be much about kindness and about removing harshness! Huzoor said that we need to reform ourselves and we need to present that example seeing which the world will say that we have achieved complete control over our emotions. Huzoor said he had said during the inauguration of the mosque in Ireland that when we will do Tabligh to others they may very well ask us that we say about the rest of the Muslims that they are devoid of guidance because they have not accepted the Promised Messiah (on whom be peace) but what revolutionary change have we brought about in ourselves since we have accepted him! Our practices should be in accordance with our teachings. We should ponder whether people of other religions or no religion, all the Hindus and all the Christians are confrontational? No, many among them are peace-loving and fair-minded. If there are also some peace-loving people among us and also some argumentative and some immoral people, then what is the distinction between them and us? The distinction will come in play when we will practice our teaching and completely remove confrontational practices or at the very least lessen them to such an extent that they will be not be obvious and everyone would feel disgust for the odd confrontational person. The Holy Prophet (peace and blessings of Allah be on him) said that if you see an evil and have the capacity then remove it with your hand. If you are not able to do so then stop it with your tongue. And if you are not able to do so then you should feel dislike for it in your heart. Ahmadi society should also have a realisation to stop a wrong practice and immorality and to give advice about it and to eradicate it and to have a feeling of dislike for it. If everyone has this realisation then even the odd person does not indulge in immoral practices and everyone tries to raise their standard. We have to adopt that way which God and His Messenger commanded and which the Promised Messiah (on whom be peace) has emphasised in this age. We should practice pardon, gentleness and love. If we see someone perpetrate unfairness we should feel as if it has been enacted on us, in fact we should feel as if the person of the Promised Messiah has been attacked. It is our task to stop the attacks of such people, if not with our hands, then with our tongues and have dislike for such actions in our hearts as well as pray for the victims to be saved from the aggressors. If we will react against immoral practices, our society will react against them; these transgressions will be removed from among us of their own accord. But it is noticed that sometimes, especially in martial issues, parents and siblings also join in the conflict and what’s more rather than counselling, in the guise of friendship others also step in. In order to reform society rather than get involved in such unfairness we should consider attacks on the victim as attacks on the Promised Messiah (on whom be peace). If we follow this our society will rectify itself very quickly. Our attitudes will fulfil the objective of the Promised Messiah (on whom be peace). May God enable us to set examples of worship of God as well as examples of high morals and also enable us to make others set them and not get embroiled in confrontations and bring disrepute on the Promised Messiah (on whom be peace). May God protect us from all kind of self-centredness! 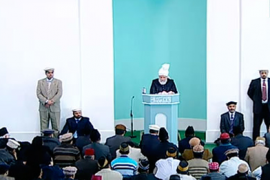 Next Huzoor announced that he would lead a funeral Prayer after Friday Prayer. Asiya Begum Sahiba, wife of the late Chaudhry Muhammad Abdul Rahman Sahib of Inner Park passed away on 3 October at the age of 69. She was regular in her Salat and keeping fast and she gave alms. She had a patient nature and was very keen at financial giving. She was a Moosia and leaves behind five daughters and two sons. Her son Ishtiaq Ahmad is a missionary in Pakistan and Ijazur Rahman is a member of the special security team here in the UK. May God elevate the station of the deceased and enable her children to tread paths of virtue.